The system will show you the changed events since your last login, if you are a registered user. Dennis Mannion, a "C" 1/13 FO attached to K 3/26 on Hill 861 advised me that that the KIA from this event was not a 3/26 member. He is PFC Walter TYRCZ Jr, KIA, a member of 2nd Platoon "A" 1/26, who were sent on the hill as replacements for Kilo's casualties. Kilo 3 received heavy carbine fire from YD575265 and light SAF from YD575269 resulting in 1 USMC WIA. Kilo 3 returned fire and VC fled southeast. No further contact. No evidence of VC casualties. 1650H: A G 2/9 patrol discovered several natural caves in the vicinity of YD734134 that had recently been inhabited by the VC. The patrol searched the area with negative results. India 3 took 3 82mm rounds from an unknown grid. ( LATE ENTRY in SitRep #368) 01311430H: 3 platoons from Lang Vei Special Forces Camp made contact with 3 enemy companies in the vicinity of XD810373. The Friendlies withdrew and air strikes were run. Results 20 NVA KIAC and several weapons captured. Do not add totals to 26th Marines. "Late Entry" in SitRep #339. 33Rd Battalion reported 1 tank destroyed by the air strike. 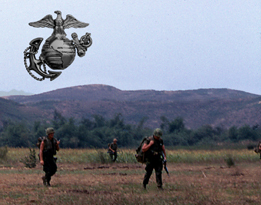 A 1/7 tripped a ChiCom grenade booby trap in the vicinity of AT997587 wounding 2 USMC personnel. 0317115H: An OV-10A from VMO-2 supported India and Lima 3/26 in field operations. Observed trail from AT840710 to AT855708 to AT859705 and paralleling blue line to east. Well used trail. Observed possible cave entrances at AT858688. Worked with "BRIGHT LAD INDIA" at ZC217463 where they observed rockets were launched from - negative sightings. "INDIA" started arty at grid when we departed area. Worked with "BRIGHT LAD LIMA" and relieved "COWPOKE 8" on station. "LIMA" had received small arms and .50 cal rounds from AT845502. "HOSTAGE M" ran fixed wing at grid with the following results; "HELLBORN 220", AT849502, on 1300H - off 1309H, 80/negative BDA, expended rockets and miniguns. Took smal arms fire from AT855497, reported by "BRIGHT LAD 14". Ordinance expended: 13 (HE) rockets, 13 (WP) rockets, 500, 7.62 rounds. Pilot Capt Sower - "HOSTAGE MIKE"
AO Lt Strooband - "HEADCOLD 62"
03170700H: A UH-1E gunship helicopter from VMO-2 supported field operations of Lima 3/26. The duty hours were from 0700H to 1305H, during that time the aircraft flew 2.9 hours, 19 sorties, took enemy fire, returned fire with 48 rockets and 4,000 rounds (machine gun ammo). Made 3 different flights to evacuate 3 USMC emergency casualties. MMAF > AT838378 VR WX > AH > AT8449 > Took Fire & returned AH (R) > 8449 took & received fire, AH > AT8449 pick up emergency medevac (ll E) > AH > 8449 received & returned fire > AH > AT854504 returned & took .50 cal fire > AH > returned & took fire > AH > AT806478 pick up emerg medevac (ll I) > G-4 > MMAF. Lima 2 received enemy 30 caliber and sniper fire resulting in 4 USMC KIA and 5 USMC WIA. Lima 2 returned fire killing 1 NVA wearing a helmet and flack jacket. 03171530: An OV-10A from VMO - 2: ran airstrike and arty mission in support of L 3/26, at grid coordinates AT 845499. The nature of the target, two active 50 cal sites. Hell Born 466, TOT 1345/1355, 80/80, Neg DBA. Deerlodge Alpha, TOT 1710/1725, # of rounds 15, 8 fighting holes destroyed, 30 meters of trenchline. Quang Nam Province. Hostile. Ground casualty. Gun or small arms fire. Quang Nam, Hostile, Ground casualty, Misadventure. Friendly mortar fire. Entry in VMO-2s Command Chronology report - On 17 March 1969 two VMO-2 aircraft (1UH-1E and 1 OV-10A) were involved in an emergency medevac in support of BRITE Lad Lima located at AT851502 and AT851504. The UH-1E and the OV-10A delivered suppressive fire to help Brite Lad Lima then in heavy enemy contact. One active .50cal site was destroyed by the OV-10A and the second active .50cal was credited to the UH-1E gunship. The gunship received one round resulting in a minor wound to the gunner. The two types of aircraft proved to compliment each other in coordinated fire suppression missions. 03171500*H: An OV-10A from VMO-2 supported Lima 3/26, while in contact with the NVA. VR'd for Auditor AA site at AT895505. Worked for Lynch Law "H", fired Deer Lodge "A" at bunkers in the treeline AT88751*9 (the 1 could be a 7). Was diverted to Bright Lad Lima and fired Black Bottom at AA site, ******** holes and bunkers AT849501. Patrol engagement. 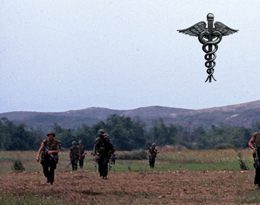 Quang Nam Province, Hostile, Ground casualty, Small arms fire. Quang Nam Province. Hostile. Ground casualty. The defensive position of BLT 3/26 CP was hit by 82mm mortar rounds. 1201400.2H: One NVA soldier at XD855417 with an AK-47 and carrying a white flag gave self up to B2 1/26 patrol. The suspect was turned over to ITT. Add 1 detainee and 1 IWC. Quang Nam Province. Hostile, ground casualty. framentation wounds. Mike Company sighted approximately 35 VC/NVA moving south at AT904822. The unit called in a fire mission. The area was searched by Mike 2 and found 2 VC/NVA KIA numerous clothing and 782 gear and blood trails leading east. LATE ENTRY from SitRep #352 Re: 01271530H, "ADD THE FOLLOWING". A reaction force was called to the area to assist the patrol. The patrol had uncovered a fighting hole and dropped a grenade in the hole critically wounding the NVA in the hole. Many other spider holes were found in the area by the patrol and the reaction force, who had continued on their mission. C 1/26 from their lines observed mortar flashes and rounds landed in the patrol's area. 1/26 called fires on the mortar at XD860429. Target coverage was good but results could not be observed. The NVA were believed to be a recon unit from an infantry battalion. They were wearing cloth over their faces and heads which blended with the elephant grass. The bodies were stripped of equipment, documents and weapons. Captured weapons and equipment: 1 RPG-2, 1 SKS, 2 ChiCom grenades, 1 AK-47, and assorted documents. Plans are to cover the same areatommorrow. Casualties: Add 3 Friendly WIAF, 1 WIANE, 1 KIA. At 1600H Lima 3/26 at YD304564 a PF found 1 large serrated ChiCom grenade at the above coordinates. The grenade was found on a sign used to intimidate voters. The grenade was destroyed in place. At 0055H the 3/4 CP at YD114701 received 52 rounds of 85mm artillery and recoilless rifle fire. Returned fire with D/S (direct support) NED weapons. INTELLIGENCE As reports indicated during the previous months enemy activity just prior to during and subsequent to the South Vietnamese National Election (3 September) increased over the previous 3 months. It was characterized by artillery attacks against DONG HA Combat Base and subsequent heavy artillery rocket and mortar attacks against the out posts of C-2 (YD1364) CAM LO (YD1461) and CON THIEN (YD1170. GIO LIN (YD2174) continued to be shelled by artillery to a lesser degree than CON THIEN. Propaganda leaflets were delivered by mortar shells against CON THIEN and C-2. Toward the end of the month enemy activity lessened. Sightings and contacts were few. Harassing and Interdiction fires continued against C-2, CON THIEN and GIO LINH. Two helicopters from HMM-363 made 4 trips from YD146678 to DONG HA evacuating 10 emergency and 22 priority casualties. India Companys two platoons while patrolling west of the Battalion perimeter began receiving small arms fire from 3 sides by an unknown number of enemy at YD110670. The initial fire resulted in 3 USMC WIA. A base of fire was established using small arms fire, M-60 and M-79 and the company attempted to move forward but received 2 USMC KIA. The intensity of the enemy fire prevented the recovery of 1 KIA in a bomb crater but the remainder of the casualties were recovered. At 0945H 4 breeches were located in the double apron fence at the northeast corner of the CON THIEN perimeter. They were 10ft 10ft, 15ft, and 20ft, blown by Bangalore torpedoes. The wire was repaired. Capt Ken PIPES: Early in the afternoon 2nd Platoon of B 1/26 reported the presence of a possible NVA waving a white flag on the northwestern side of the runway… With the Ontos on the range covering us, a fire team from 2nd Platoon, the Ontos Officer and * moved some 500 meters outside the wire... The NVA soldier reappeared and surrendered. He was a lieutenant. Quang Tri Province, Khe Sanh, Hill 881S. Hostile, Ground casualty, Artillery, rocket, mortar. Gunny Wire, the Company Gunny and Gunny Robitaille, the Weapons Platoon Commander, both were killed on 23 February 1968. "Gunny Wire and Gunny Robitaille had dug themselves a nice-sized foxhole down in the middle of one of those 2,000-pound bomb craters, so they were already 16 feet below ground. Then they dug another six feet down. They were sitting down in there, and one of these things (incoming rounds) came in and landed right in that hole. They were both killed ..."
Operation Kingfisher. Quang Tri Province. Hostile, Ground casualty, Small arms fire. On patrol Quang Nam Province. Hostile, ground casualty, gun, small arms fire. Mike Company while providing security for the THOUNG DUC motor convoys received several 60mm mortar rounds in the vicinity of ZC 193559. Intense artillery fire was returned but results could not be observed. Throughout the day several landmines were uncovered and destroyed in place. Results were 2 USMC KIA 5 USMC WIA. 03061530H: A US Air Force C-123K on final approach to the Khe Sanh Combat Base air strip was directed to execute a go-around as a VNAF Birdog without radio communications with the tower was making a landing on the strip in the opposite direction. The C-123 made a right hand turn which took over NVA anti-aircraft guns. The aircraft was hit several times and it crashed approximately 7 km east of the Combat Base at XD933404. The 3 crew mwmbers and 44 passengers were all killed in the crash. 01131300H: Two CH-46A helicopters from HMM-164 carried .9 ton of cargo and transported 97 Marines in 22 sorties. From USS Tripoli to USS Ogden , 11 times. In support of BLT 3/26 and Operation Bold Mariner. Crew Chief HIAN, R. L.
Operation Oklahoma Hills. Quang Nam Province. Hostile, Died of wounds, Ground casualty, Small arms fire. WIAE 04262100H, DOW Navy Hospital Da Nang at 04271130H. HMM-263 CH-46 medevac at ZC168613 casulaty taken to NSA.